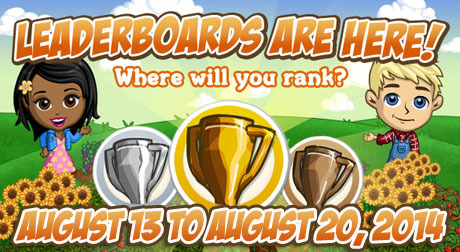 Here are the details for the FarmVille Leaderboard feature that will run from August 13 to August 20, 2014. This will serve as your guide if you are planning to participate. This feature usually gives farm support items and the tasks is not that difficult. Prepare the following materials Pixie Mushrooms Bushels, Sandersonia Flowers Bushels, White Squills Bushels, Wishing Quarter and High Score Card. Harvest White Squills (FairyTale Field Crop) to get to the top of the list! 4 hours to grow and harvest. Craft Lightray Assimilator! to get to the top of the list! Can be crafted for 2 hrs at Magic Garden’s Alchemist Hat and will need Wishing Quarter x2 and High Score Card x1. Make Skate of Swiftness to get to the top of the lists. For each craft it will need Pixie Mushrooms x3, Sandersonia Flowers x3 and White Squills x3.